A slightly sweet, tender vegetable covered with a shiny skin that ranges in color from purple, which is the most familiar, to red, yellow, or white, depending on the variety. The shape of the different varieties ranges from a pear or globe shape to a long, slender shape. Aubergine requires a long, warm growing season, so it is most plentiful in late summer to fall. 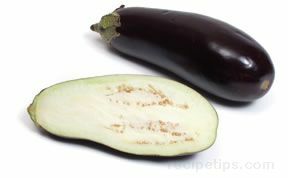 Aubergine is excellent when sautéed, broiled, baked or slowly cooked in meat dishes and stews. In the United States, it is more popularly referred to as the eggplant.